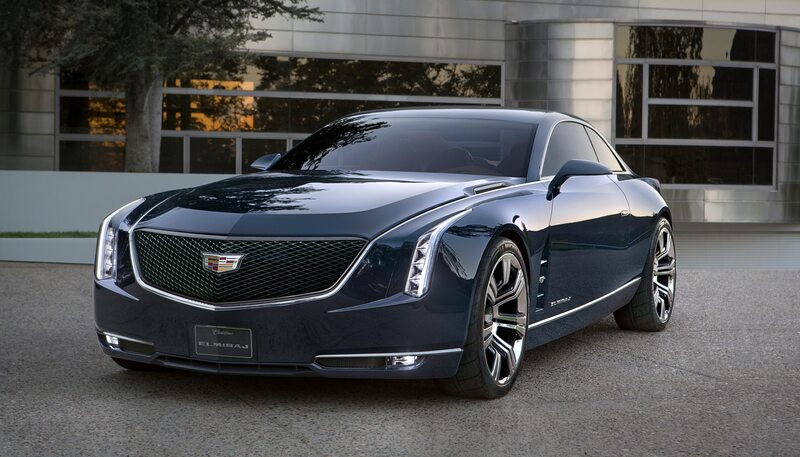 Cadillac’s eye-catching Elmiraj Concept is on display at the 2014 Chicago Auto Show, presenting a new vision for luxury driving that could be a future Cadillac model. The dramatic two-door hardtop styling communicates power and performance, plus, the long wheelbase and clean body side characterizes the car’s spacious dimensions. Cadillac’s vertical light signature is represented in both the headlamp graphic and taillight, and a character line in the sheet metal extends the full length of the body side, connecting those vertical front and rear elements. As a rear-wheel drive prototype, Elmiraj is powered by a 4.5-liter twin turbocharged V-8 delivering an estimated 500 hp. The engine takes the baseline technology from the new Cadillac Twin Turbo V-6 featured in the upcoming 420-hp 2014 CTS Vsport edition, and expands it to the classic performance format of a V-8 engine. The 2+2 cabin layout features high-performance seats, designed to support spirited driving while also delivering luxury accommodation. Designers created the upper section of the instrument panel is a single piece extending across the full width of the car, while the lower forms a cockpit space tailored for performance. Backlit titanium trim curves from the cowl to the doors, dividing the rich upper camel leather from the handpicked fallen Brazilian Rosewood wood veneer trim. Elmiraj passengers might actually lobby to sit in the back, as the rear bucket seats recline for additional comfort.